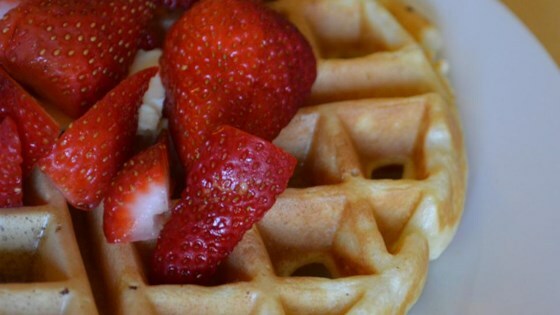 "An easy waffle recipe that results in a nice crisp outside, and tender middle waffle. I love the results this gives while not having to separate the eggs and take time to whip egg whites! These will also reheat in the toaster for a quick work day breakfast." Whisk flour, sugar, baking powder, baking soda, and salt together in a bowl until evenly combined. Whisk buttermilk and butter together in a separate bowl; add eggs. Stir buttermilk mixture into flour mixture until just combined and batter is slightly lumpy; add vanilla extract. Pour enough batter into the preheated waffle iron to reach 1/2 inch from the edge. Cook according to manufacturer's instructions. You can heat the oven to about 250 degrees F (120 degrees C) to 275 degrees F (135 degrees C), and place a rack on a baking sheet to keep waffles warm as you make the whole batch. We like the look but the flavor was bland for us. The buttermilk really yields a very nice waffle. Definitely will be making again. I have to admit that these waffles turned out perfectly, whether you like them softer or crispy. Doubled the recipe for four people allowed for no leftovers in my house!